Some games stand the test of time much better than others. Great gameplay, interesting characters and plot, and a unique experience all around contribute to a game’s staying power. Sentient meteors, tentacles, and a plot to turn all of the world into zombies doesn’t seem to hurt, either. If you mention the name ‘Maniac Mansion’ to a Nintendo player of old, there is a good chance they will respond with a nostalgic “Awww!” or “That game’s awesome!”. Even with a PC port of the game, a sequel, and a television series, it stands to wonder if this classic really stands up to the test of time. At the time that Maniac Mansion was released, it implemented a system that came to be known as ‘SCUMM’, or ‘Script Creation Utility for Maniac Mansion’, in many LucasArts games in the future. This system was used to make the game development easier, and it also made it easier to port the game from the original Commodore 64 version to the NES. It received great reviews on its release, despite great amounts of censorship. One of the publishers even wrote an article on the battle they went through with Nintendo of America at the time. The game still hit shelves in the US thankfully. Okay. Things are definitely weird here. Out of the six characters, you can only choose two to venture in with Dave, making for a roster of three hapless teens that you can use in any given playthrough. Each of them has their own talents- almost. Dave seems to be the only one without a special talent, save for being capture bait in certain situations. Outside of that, he serves no specific purpose aside from being Sandy’s boyfriend. Syd and Razor are the cool musicians, and both can play a mean piano. The colorfully sweatered Michael is a photographer for the school paper, while Bernard, the nerd, can fix radios (and make the game incredibly easy). The prim Wendy can write and edit great manuscripts, and Jeff, the surfer dude, can fix phones- as most surfer dudes were known for. My personal favorite grouping involves Syd and Wendy, but whatever configuration you choose, you must use their unique abilities to save Sandy and make it out of the mansion alive. The game’s puzzles range from brain-numbingly easy (using paint thinner on the painted wall) to pretty difficult (just try beating the game with Wendy), but there were never any points that victory seemed too far out of reach. On first playing through, the mansion can be a little confusing, but as you get used to the game, you get used to the mansion and its layout. Interestingly, your characters can die. It takes some effort and some considerably overt moves, but it’s a touch that makes the game more interesting. The game asks you to think logically, but it does not tend to challenge the player much more than any other adventure game of the sort. 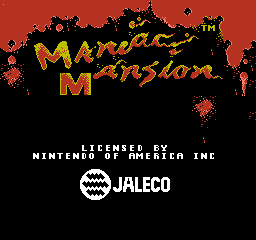 Another feature that was just coming into play in the gaming world at the time was illustrated by the fact that Maniac Mansion has multiple endings, depending on what group of kids you use and how you go about your victory. While this would be implemented in plenty of later games (Clock Tower from the Playstation comes to mind, given some similarities to this game), it was a forerunner, and that says something. This game paved the way for a number of adventure games and did it well. Maniac Mansion is a linear game, it strode to have branching paths to achieve the ultimate goal. The humor of Maniac Mansion, however, is what most people remember. Most players remember acquiring Ed’s hamster and the subsequent events that surround it. From Bernard trying to escape at the front gate to the suspicious conversations between Ed and Edna intercut with your gameplay, there are some quality quirky moments. While some insults (Tuna Head, among others) are incredibly corny, it adds an element of campy B-horror to the game, and it only aids the atmosphere surrounding the adventure. Some jokes may fall flat, but most of them will bring a smirk to any player at the controller. As far as graphics are concerned, they are about par for the course. Some great textures, and the cartoon motif helps the game even more, but nothing impressed me more than the opening sequence. The colors are bright, alleviating any idea that this may be a serious game, and nearly everything looks like what it’s s upposed to. That may not sound like a big accomplishment, but in the Nintendo era, it seems that it is does not happen as often as one might expect. The music is a high point of the game. Every kid has their own theme in their CD Player, which can be turned on or off, and the themes are very fitting within the game. From the guitar rips of Razor’s theme to the techno pop beats of the theme song, the music keeps it interesting to play the game, even when you do find yourself stuck at any point. They show their age, for sure, but it’s hard not to have a soft spot for the soundtrack. All of that considered, there are very few problems with the game. There are some graphical shortcuts I wasn’t a fan of. When you send a kid up the stairs, for instance, it appears that the sprite is cut into two halves, which alternate going up and down to create an awkward climbing motion. It’s not enough to ruin the experience, but it is a sign of the times, given that it was probably difficult to try to animate that particular motion. There is also no shortage of useless items to bog down your inventory, but that’s more a problem with many adventure games on the whole, not just this one. Everything gels together well in the game logically, even if you occasionally miss the items you needed. This game rises above what few faults it has easily. Maniac Mansion is deservedly a cult classic. If you like a well thought out and quirky game, the game is a challenge, but it’s worth the time. With multiple endings and different characters to affect game-play, it’s a game that you can come back and play anytime you get the urge. It takes a strong stand against the test of time, and I highly recommend it to anyone who has a taste for adventure games or just something different.